I just recently bought a new (to me) Plasma Cutter, so I thought I’d give it a whirl. It’s always best to practice with a project in mind so I set out to makes some holes in steel that I can fill with copper and practice some metal inlay techniques. Along the way I decided to film the process and make another Youtube video for my channel. Enjoy! In our conference area at work we had a rather interesting table. It was a huge poster of James Dean sitting on top of a piece of wobbly antique furniture. It was time to upgrade the desk to something more usable and fitting of serious meetings. Clients don’t like to sign expensive contracts on a wobbly table. It surely sends a message of sloppy workmanship and an attitude of “eh, good enough” that will give someone a little bit of subconscious uncertainty about our company. The idea was to utilize some existing counter top pieces from IKEA. They were relatively cheap, easy to finish, and I could focus on an interesting frame to hold them up. I started with some 1 1/2″ steel tubing from the local metal place. I drew up a plan on a napkin and started cutting, cleaning, and prepping the steel for welding. I drilled holes in the frame so I could easily bolt the wood down to keep everything sturdy. For each bolt I put a small hole on the top and a large hole on the bottom of the square, so I could use a drill gun to tighten the bolt. It was much easier to measure and drill everything before I welded things together. It’s extremely difficult to steady a table frame on the drill press! For the past few years we’ve been dealing with buttons. Moving, storing, sorting, picking through, and generally managing a large collection of castaway buttons from a previous company. Some were usable, but many lacked the micro-switch that gives the button any functionality at all. Why do I mention this? 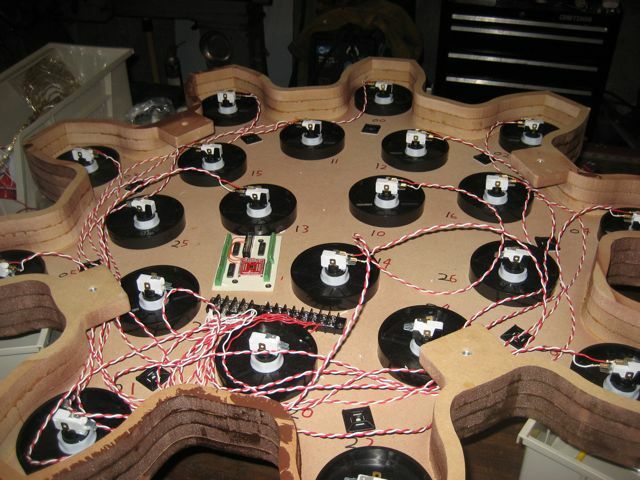 Because having these buttons made us try and think of ways of getting rid of them using them for fun projects! It seems that my blog has been linked to by one of my favorite sites on the internet: ThisIsColossal.com. I’m just tickled pink. When I first emailed Bob I was just selfishly looking for some inspiration and tips. Since then we’ve been emailing back and forth every few months. I’ve even helped connect him with some of his cousins! What has Bob been up to lately? Well, he’s got a show going on right now in Jakarta, Indonesia (or is it in Dubai?). http://www.artdubai.ae/2013/galleries/edwins-gallery Bob tells me that there was a scary moment when they plugged his 110V motor into a 220V socket! Luckily the docent was fast and unplugged it before the motor fried itself. 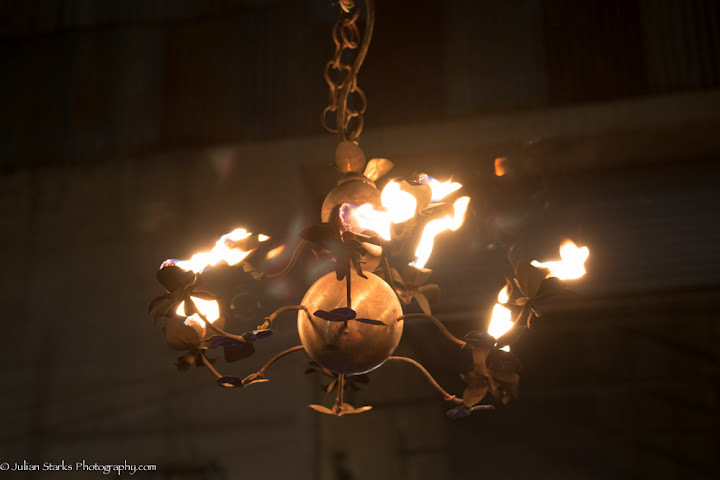 Be careful with the standard voltage sources if you’re showing electrical art pieces worldwide! Bob has also told me about a documentary that features the Old Timey folk band he was in, Highwoods String Band. There are a few snippets of interviews with Bob in this, but it’s all about his fiddle playing, not about his other amazing talents. We decided to take the Feast out for a memorable Thanksgiving dinner. 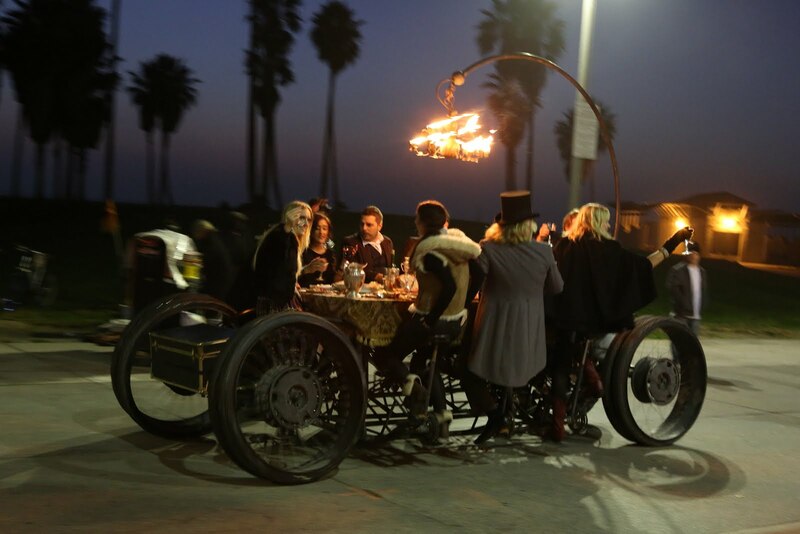 We had no real plans besides cooking up a bunch of food, and taking the Feast to the Venice boardwalk. Our policy was to have a blast, come what may, and if we needed to, split the ticket. We got picked up in the blog Yo Venice, to boot! Update! 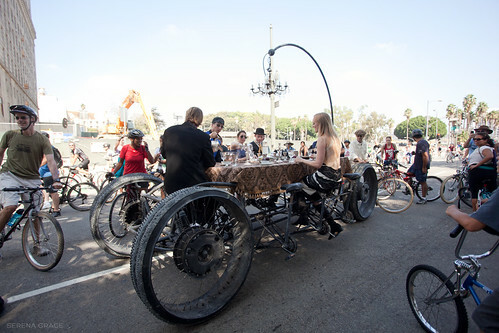 A Moveable Feast goes to CicLAvia, April 21, 2013. 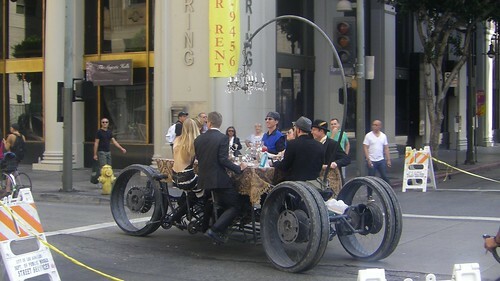 On Sunday, October 7th, we put the tablecloth on A Moveable Feast, hung the chandelier, and headed out for a nice pedal through the streets of LA for CicLAvia! We set out at 10:30 or so with 6 pedalers. We had no problems crossing the LA river bridge and train tracks into downtown proper. The biggest obstacle we faced was a steep hill from Spring up to Broadway into Chinatown. We pedaled hard and with gusto and were able to mount the hill without having to get off and push. This was our first major hill since the new drivetrain, and I was definitely impressed! CicLAvia was alive with thousands of bicycles in the streets. Everyone was waving, cheering, and smiling as we pedaled through. We must’ve raised our glasses to hundreds of cell phone cameras throughout the day. Everyone wanted to talk to us about the project and give us their complements. We were tickled pink. It’s always a great feeling to have other people truly enjoy your creation. We had to stop a couple of times to take a break and refill our crystal and silver water containers. But, spirits were high and we weren’t as tired as I thought we’d be. We met up with Catherine who brought her magic camera. She always takes jaw dropping photos, so I’m definitely looking forward to the results. After a short stop at the Down & Out for some hydration and simple carbs, we hopped back on the Feast. We decided to turn around once the route turned on 7th street. However far we pedaled that day we were going to have to pedal back. We didn’t want to get home late at night, so we decided to start the slow trek back home. Surprisingly all of the gearing, chains, and sprockets stayed functional without so much as a chain needing to be re-attached. This was the first time that no one had to crawl under the table to get their hands dirty re-aligning some chain. Is the Feast getting actually reliable? I couldn’t be happier. If you find more photos out there, let me know in the comments.